I couldn’t get myself out of bed but it didn’t matter in the end. I was on the water around 10:15am and the surface temperature was 55.8. Knowing that these crappie either relate to shoreline stricture or small weed patches in no mans land, I started working the perimeter first. I fished for about an hour and a half without as much as a bite. I was contemplating heading elsewhere .Before heading, I had to check one small section of dark weed patches that produced nothing earlier. The water temperature hadn’t gone up at all but it would only take a few minutes and quite often this is a hot spot. On my first cast I hooked into a crappie but lost it before the boat. Immediately, I tossed out my second pole to see what a deadstick with worms would produce. While I tried battling the wind for a while using my trolling motor, it was more effective to set out my anchors. The fish had turned on. I was catching a crappie about every third cast and a bluegill or pumpkinseed just about every cast if I let it soak. The crappie were very spot specific as there is an abundance of these dark patches. I found them to be on only three though. Most times I work the “Live” Baby Shad from Lake Fork Trophy Lures fast with a popping action under a bobber. Today they wanted it moving slow with about a three second pause between pulls. I tried adjusting the depth of my jig several times but it was a very specific 22″ down. Any deeper or shallower and you caught nothing. To see these fish in their spawning colors was great. While they would have tasted good they were released to get their business over with. Maybe in another couple of weeks I won’t be so kind! 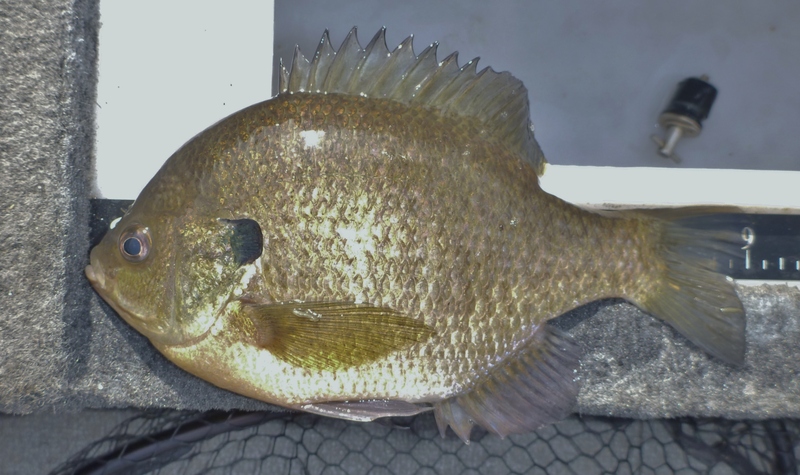 Previous Post5-1-14 – 5-5-15 – Long Weekend On Pymatuning ReservoirNext Post5-11-14 – Man They Are Addicting! Do you use a clip-on bobber , or slip bobber. Wondering about that ‘popping’ action you mention.